In my experience as a nurse, it takes only minutes to push in 50 ml of d50 and it would take considerably longer to push in 250 ml of d10. I’d rather spend the extra money on d50 when the patient is unconscious from hypoglycemia time matters. I guess its just a Nurse thing to truly want the best outcome for the patient. I am certainly not willing to put my patients life at risk for a few bucks. In my experience as a nurse, it takes only minutes to push in 50 ml of d50 and it would take considerably longer to push in 250 ml of d10. That is one of the problems. You are pushing D50. You are not pushing D10, so it is less likely to cause infiltration. 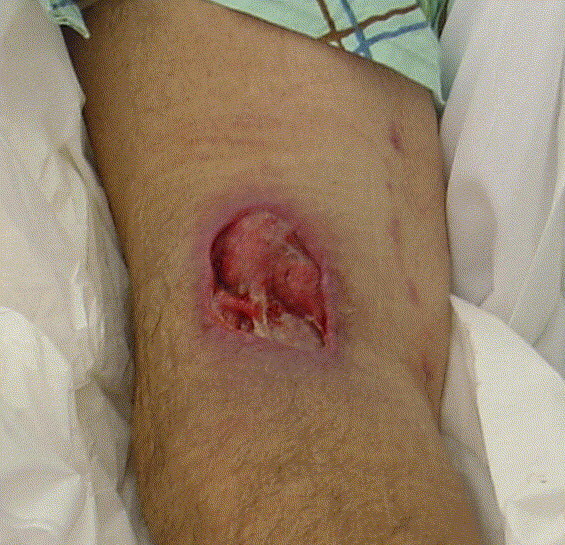 Due to its hyperosmolarity, infiltration of D50 can cause necrosis, unless treated with hyaluronidase. This is why hyperosmolar solutions should only be pushed through a central line. We make exceptions for D50 and calcium chloride because of our ignorance. I’d rather spend the extra money on d50 when the patient is unconscious from hypoglycemia time matters. Clearly, you did not read the research. There was no difference in time to recovery between the use of D50 and the use of D10. If time matters, it is the time to recovery, not the amount of time you are doing something. This is about the patients, not about you. I guess its just a Nurse thing to truly want the best outcome for the patient. Again, if you read the research, you would understand that D10 is what is best for the patient, while 50% dextrose is more harmful. I am certainly not willing to put my patients life at risk for a few bucks. Apparently, you are not willing to read some research to find out how to protect your patients. Your arrogance is dangerous. I hope that you do not hurt too many of your patients with your willful ignorance. Learn what is best for your patients. While I find RN Lauber’s post to be problematic, I think your positivity on this issue is unwarranted given your citations. The review paper you cite lists only one RCT, which is the other study that you site. In describing the potential harms of D50 it does not describe any extravasation injuries and does not compare the risk of D10 vs. D50 beyond what the original RCT does (since that’s the only evidence that directly compares the two). Instead, it addresses a case report that involved a medication error in which an in-patient neonate was given D50 half-normal saline for over 11 hours and suffered an almost unbelievable level of hyperglycemia as a result. This is not applicable to pre-hospital administration of 25g of D50. It asserts that D50 presents a greater risk for extravasation injuries based on physiological reasoning, but it doesn’t present any evidence about how this translates to actual harm in clinical practice. In terms of efficacy, the big methodological flaw in the study is that they didn’t study 25g of D50 versus titrated 5g of D10. In the design, they instructed the paramedics to administer 5g at a time with BOTH concentrations, wait one minute, then re-dose if they didn’t achieve the desired effect. It’s not surprising that there was no difference in time to GCS resolution because the patients received essentially the same treatment. Furthermore, if we’re going to use this study to say that D10 is just as good as D50, we should also use it to say that the two are just as safe because there were no extravasation injuries in either group. This would obviously be silly because the study is so small, but that necessarily means that all of its conclusions are, at best, provisional. The authors try and poke one more hole in D50 by discussing the issue of greater hyperglycemia and high dosing in the D50 arm. However, their table presents data that is wildly divergent and indicates that there was at least one (un-noted by the authors) protocol violation in the D10 group, since the range of doses is 5-30g while the study design calls for a maximum dose of 25g. Their assertion that hyperglycemia presents undue risks in this population is backed by research related to chronic hyperglycemia in critical care patients, and an article from the Annals of Emergency Medicine in 1990 addressing a problem that no longer exists, namely giving dextrose to EVERYONE who presents with altered mental status. We obviously don’t do that anymore since we have access to finger stick glucose testing, rendering concerns about transient hyperglycemia related to pre-hospital D50 administration unfounded, at least on the authors presentation. All that said, the lower dose of D10 used in the study for the same effect suggests that we could probably alter the use of D50 in two ways. First, dosing it in 5g increments, and second waiting slightly longer (perhaps 5 minutes) before administering another 5g. Since D10 was dosed in 50mL increments vs. 10mLs for D50, the longer amount of time to complete the dose could be the reason the D10 patients got less dextrose overall, since the medics could not administer doses as rapidly and resolution of symptoms at lower doses became evident. And what, it’s an EMS thing to truly want a worse outcome for the patient? That’s rather arrogant, coming from someone who obviously didn’t read the research he cited.